A lot of people in the scifi/fantasy fiction community are still hurting after two seasons of Hugo Awards drama, but another competition is trying to bridge the divide. DragonCon, Atlanta’s annual science fiction and fantasy competition, released the nominee list (see below) for the first-ever Dragon Awards this week. It includes several genre novels, comic books, films, and, interestingly, video and board games. The Verge called the nomination list a “bit of a compromise between various factions within fandom,” with nominees ranging from the popular to the obscure, with even some self-published works. Part of this is attributed to the fact that you don’t need a membership in any organization to vote for the Dragon Awards—they’re free and open to the public. It also could be because it doesn’t look like either Sad Puppies or Rabid Puppies released Dragon Awards-specific slates. Slating became a major problem last year with the 2015 Hugo Awards, when most of the nominees came from lists created by online groups Rabid Puppies and Sad Puppies (though Sad Puppies have called their lists recommended works). In retaliation, many people voted against the Puppies’ picks, going so far as choosing “No Award” when a category only had Puppies’ nominees. Fast forward to 2016, and the problem resurfaced. Sad Puppies withdrew a bit after the controversy of 2015, but Rapid Puppies creator Theodore Beale (aka Vox Day) doubled down, again using the Hugo Awards as an outlet to get works he liked on the ballot— especially from his own publishing company, Castalia House. In comparison, a couple of Castalia House books were nominated for Dragon Awards this year, but the presence is nowhere near the onslaught that’s overtaken the Hugo Awards two years in a row. Beale has also released a list of works from the Dragon Awards nominations that he thinks should win. 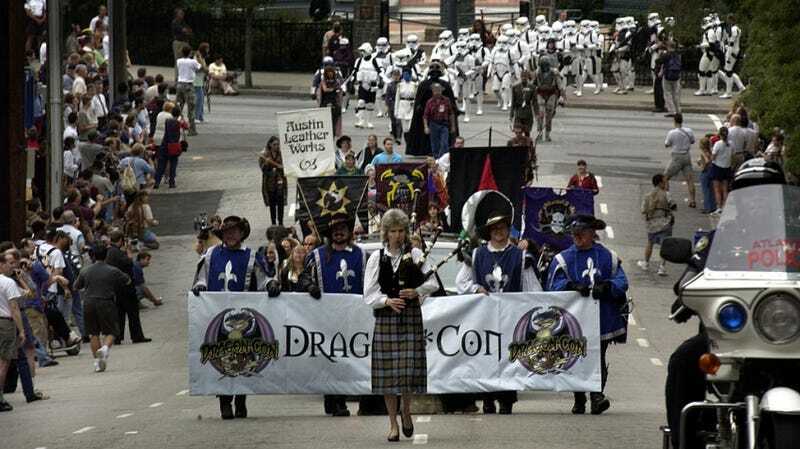 Even though it’s a new year and a new award, the wounds of the Hugo Awards’ controversy still blur into DragonCon’s list. Author John Scalzi, who was very vocal against Sad and Rapid Puppies both years, confirmed this week that he’s declining his Dragon Awards nomination for The End of All Things, along with any other nominations this year, because he wants to focus on other people’s work instead. The Hugo Awards happen next week in Kansas City, while the Dragon Awards will be at Dragon Con in Atlanta on Sept. 5. Clarification: fixed a book title from Fallen to Allies and Enemies: Fallen.